(III. 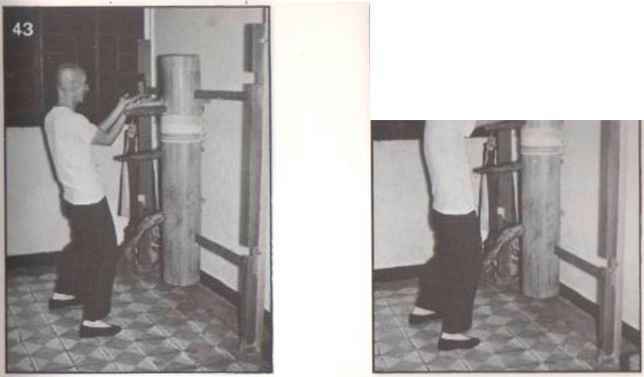 36) LEFT "SIDEWARD THRUST KICK"
Yip raises his left leg to launch a Sideward Thrust-kick at the dummy trunk. (Ill 39) RIGHT "ERECT PALM" Mil! "JUT-SAU"
Yip places his up-facing palms at the outdoor area of the two dummy area. (III. 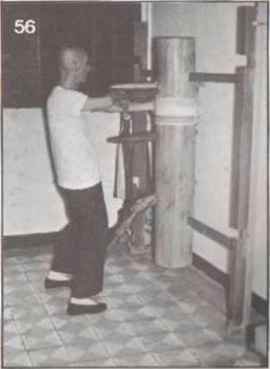 42) DOUBLE "LOWER LYING-PALMS"
Yip'« two palms enter into the indoor area between the dummy arms and strike at the mid-lower-level of the trunk of the dummy. (III. 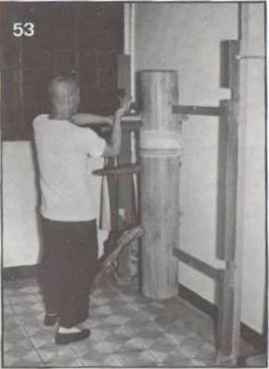 46) RIGHT "KAU-SAU" & LEFT "HIGH GAUN-SAU"
Yip shifts himself to the right, while circling his right wrist into the indoor area of the dummy arms, and striking out a left High Gaun-sau. Then Yip. 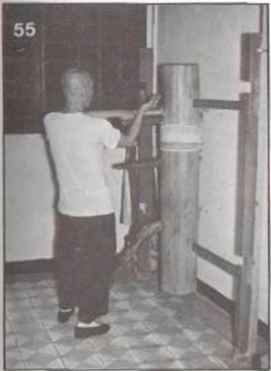 by turning his wrists circles his palms into the indoor area of the dummy arms. 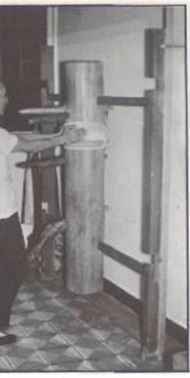 Yip then lowers his arms, placing them on the dummy arms, and exerts a powerful downward push that causes the dummy trunk to sink. (III. 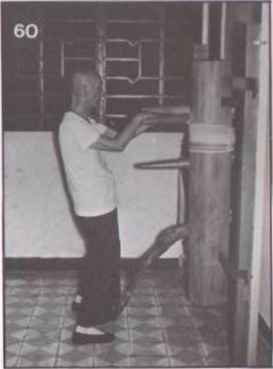 44) DOUBLE "UPPER LYING-PALM"
Yip raises his palms throuflh the Indoor area between dummy arms to strike at the front part of the upper-level of the dummy trunk. (III. 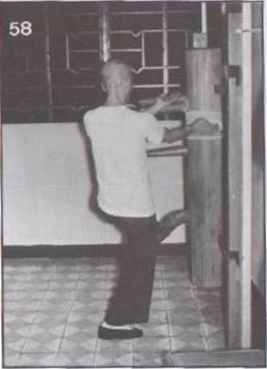 48) RIGHT "KAU-SAU" & LEFT "HIGH GAUN-SAU"
Yip repeats the movement once more. 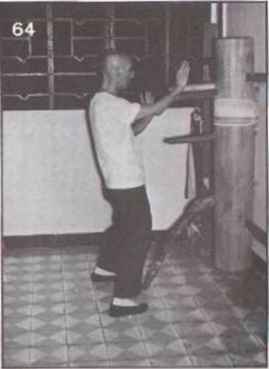 Yip po9es the Double Tau-sau by raising his palms to pass through the indoor area bo twee n the dummy amis. (III. 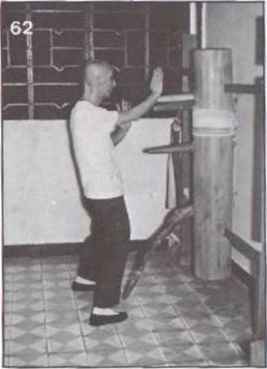 47) LEFT "KAU-SAU" & RIGHT "HIGH GAUN-SAU"
Yip turns to his left, and repeats the above movement by interchanging the movement for his arms. (III. 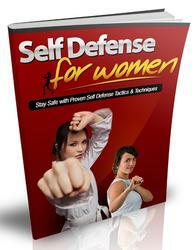 49) RIGHT "ERECT-PALM" & LEFT "JUT-SAU"
Immediately after that. Yip changes his right arm to the Erect-palm and his left to the Jut-sau. 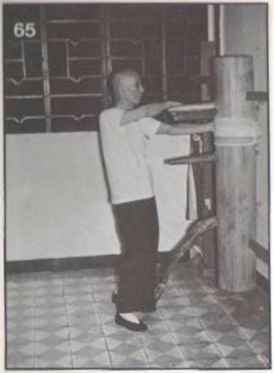 Yip turns to his left and poses the right Bong-sau. 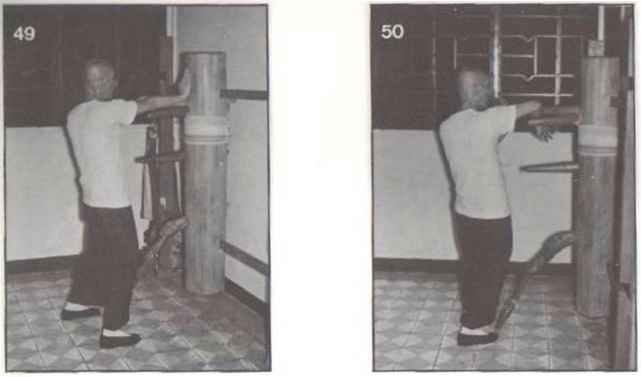 Yip turns his stance to face left, while posing his arms respectively as Kau-sau and High Gaun-sau. 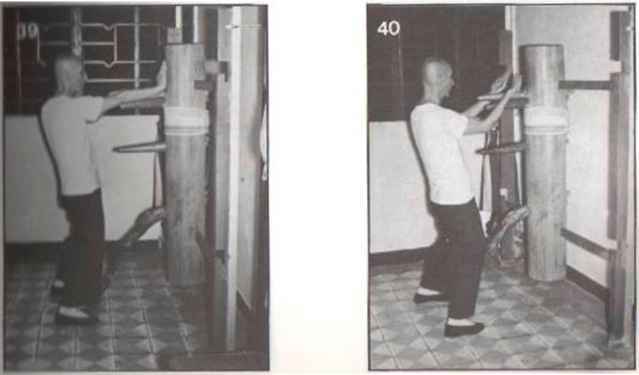 Yip turns to the right, repeats the above movement while interchanging the movement for his arms. 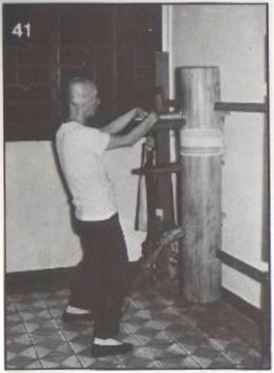 Yip repeats the Kau-sau movement. 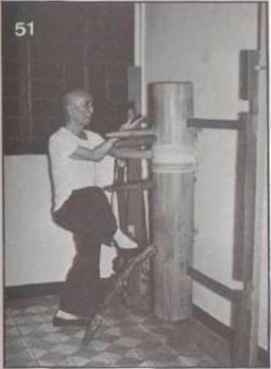 Yip withdraws his right leg and turns to his right, while posing the High & Low Gaun-sau. (III. 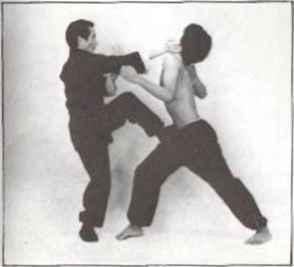 56) FACADE RIGHT "KAU-SAU" & LEFT "LOWER LYING-PALM"
Yip turns to face the front of the dummy. He poses the right Kau-saur vrf>ile raising his left arm from under the right dummy arm to strike at the dummy trunk. 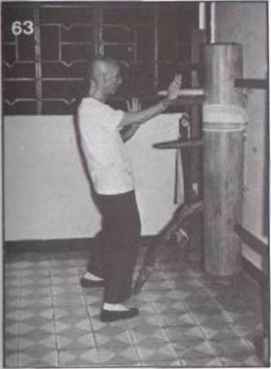 Yip turns to his right side, and poses his left 8rm as the Bong-sau. 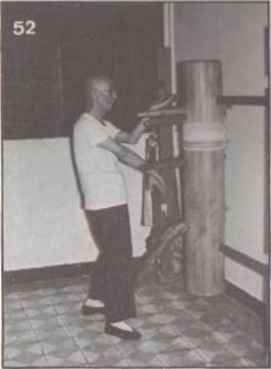 Yip first poses his right arm as the Erect-palm then strikes It at the trunk of the dummy. 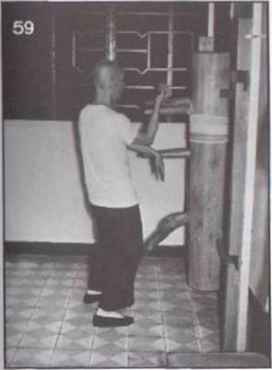 Yip steps his right foot a pace forward to shift himself to the left side of the dummy, and applies the left Knee-stamping Kick. 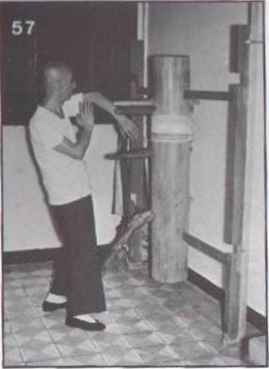 Yip first poses his right arm as the Fook-sau, then flips his right palm at the right dummy arm. 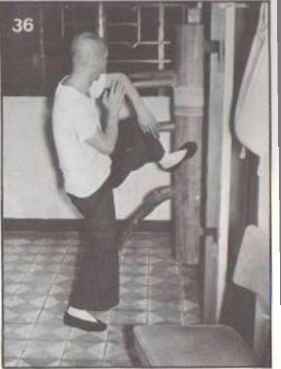 Yip withdraws his left leg to resume Its original position, then turns to face his left while posing his arms as the High & Low Gaun-sau. (III. 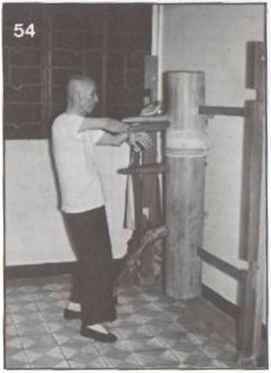 63) "FLIPPING-HAND" MOVEMENT FROM THE RIGHT "FOOK-SAU"
After that, Yip flips his right palm at the left dummy arm. (III. 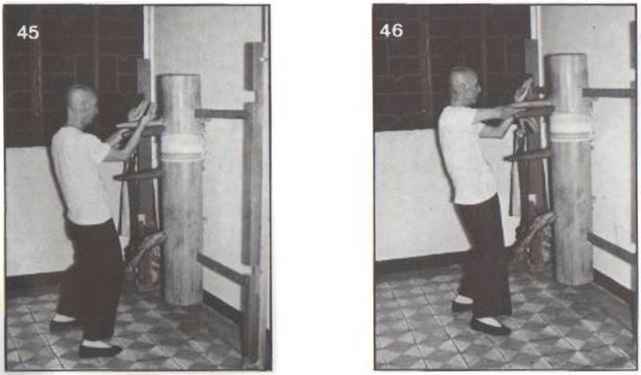 60) RIGHT "KAU-SAU" & LEFT "TOK-SAU"
Yip faces the front of the dummy, and poses his right arm as the Kau-sau, and his left arm as the Tok-sau. (III. 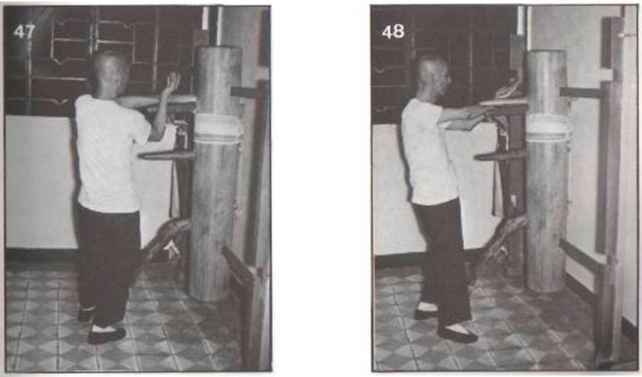 64) "FLIPPING-HAND" MOVEMENT FROM THE RIGHT "FOOK-SAU"
Yip flips his right palm at the right dummy arm again. (III. 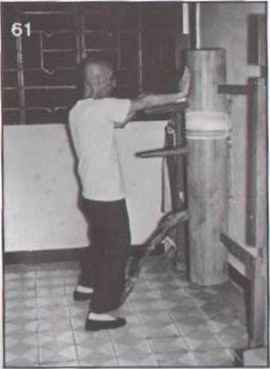 65) RIGHT "KAU-SAU" & LEFT "LOWER LYING PALM"
Yip turns to his right, poses his right arm as the Kau-sau, wtiile launching a left Lower Lying-palm strike at the right side of the dummy trunk.